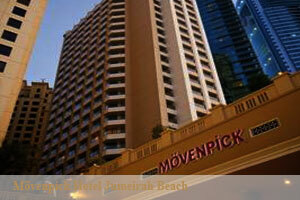 The Mövenpick is a 5-star hotel in the Jumeirah Beach Residence area. It offers luxury rooms, with elegant furnishings and modern bathrooms, a short walk from the beach. Mövenpick Hotel is close to many of Dubai’s attractions. Dubai Marina is a 10-minute walk away while Dubai Internet City is less than a 5-minute drive from the property. Mövenpick Hotel Jumeirah Beach features rooms decorated in a contemporary style. All of the rooms have a balcony with either a partial or full Arabian Gulf view. There are 3 dining venues at Mövenpick Hotel Jumeirah Beach, offering a varied menu of delicious international food. After dinner, guests can enjoy drinks and refreshments at the bar. There is an outdoor swimming pool overlooking the ocean plus direct access to Jumeirah Beach, where a range of watersports is on offer. The hotel also has a well-appointed fitness centre and spa facilities. Movenpick Hotel Jumeirah Beach is located in the heart of the chic Jumeirah Beach Residence area is just minutes away form Dubai Media City and directly connected to the beachfront. It is approximately 30 minutes from Dubai International Airport and close to major shopping and business districts. Jumeirah Beach Residence (JBR) is located on the north shore of the Dubai Marina, close to Palm Jumeirah is designed to offer a year-round beach resort destination. JBR stands amid an upmarket locale far from the city. It is a uniquely-theme environment combining Mediterranean and local architectural styles, complemented by landscaped plazas and children's play areas, fountains and courtyards. View Hotel Map Click Here! More hotels in Jumeirah Dubai Click Here!